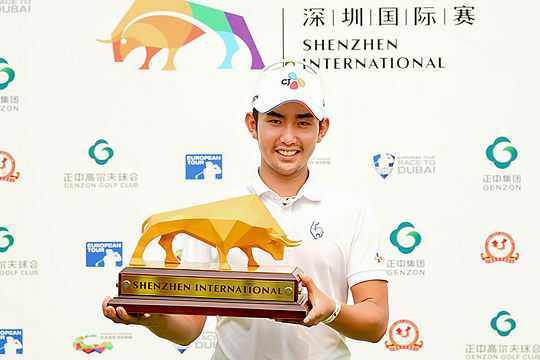 Asian Tour member Soomin Lee of Korea claimed a memorable wire-to-wire victory at the Shenzhen International to claim his first European Tour title at Genzon Golf Club on Monday morning. Lee, Alexander Levy, Lee Slattery, Joost Luiten, Brandon Stone and Scott Hend, also an Asian Tour member, all had a chance to take the crown, with just one shot separating the six players as the weather-delayed event came down to a day five shootout. The young Korean began the day in a share of top spot with five holes to play and a birdie on the 16th followed by superb eagle on the next helped him sign for a closing 71 and get to 16 under. The 22-year-old finished in the top three on his European Tour debut at the UBS Hong Kong Open, jointly sanctioned with the Asian Tour and European Tour, before that drama at Selangor Golf Club and now enters the winner’s circle in just his sixth start. “I got a big chance in Malaysia but I didn’t make it because I was really, really nervous. Now I made it,” said Lee, who is expected to break into the world’s top-80 following his victory. Scott Hend finished the best the Australians in a tie for 4th at 13-under and three shots off the pace. Nathan Holman fired a final round 76 to slip back in to 35th place while Wade Ormsby was 54th.